Higher density living has residents of the Waimahaihai District up to their eyeballs in automobiles. While the day-to-day commuter cars are understandable, residents quickly become frustrated with “car hoarders” who collect broken vehicles like baseball cards. Mehani Circle, in the very heart of the Waimahaihai District has two “hot zones” where vehicles are lined up bumper to bumper. Not only does it cause visibility issues around the constantly curving road, it makes for a dangerous mix with pedestrians navigating the sidewalk barren roadway. 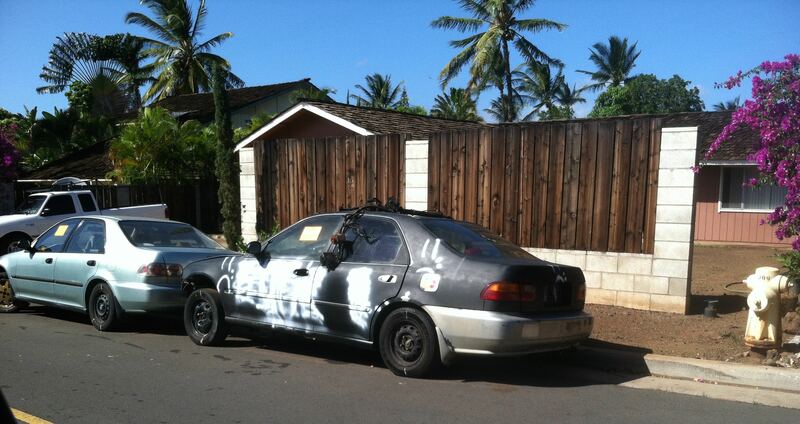 Kudos to the Kihei police patrol who has been diligent about marking tires to enable Maui County to eventually haul off the unsightly clunkers. This morning the MPD Officer did the courtesy of personally notifying the residents at the adjacent property that the vehicles needed to be moved within 24 hours. this time, or the tow truck is coming. Well, let’s just hope. Neighbors are frustrated with the length of time it takes from the first call to the “giant hook” appearing on the scene. Achieving successful vehicle removal is not as simple as one phone call. It might be easier to dance the Tahitian fire knife dance at a luau. It takes training and a lot of patience. If you click on the picture above, you’ll see evidence of more than one set of tire marks, the police’s way of clocking movement. Once tried and failed, let’s how this time around the towing will “stick”. So, if your front yard view suddenly becomes a wall of derby car metal, the MPD suggests that you pick up the phone and call, call, call it in! But before you do, you’d better have a note pad, details, and be prepared to follow the vehicle through to “D” day–that’s “dee” for disappearance! Use technology. Snap a photo of the vehicle with your smartphone to help you document the date and time, and gather relevant info you’ll need for the call. Write down the vehicle make [Honda, Toyota, Ford], and model [Accord, Rav4, Ranger], and color. Be prepared to give a street address closest to the abandoned vehicle. Unless the vehicle is on fire, or sitting on top of a human being, save “911” for real emergencies. You need to call the general NON-emergency number for the Maui Police Department: 808-244-6400. Prep your justification: the dispatcher will take all the pertinent information. They may ask you how long the vehicle has been there. If there is any special condition which makes you believe it is abandoned. The dispatcher should ask you whether or not you want the police officer to follow up with you after they do a site visit. You WANT this! Ask the dispatcher for an incident number or reference number, or the name of the officer who may be following up with you. If they don’t have a reference number, note the date and time you’re calling and get the dispatcher’s name. You may need this to reference the event in the (unfortunately likely) event that the vehicle gets tagged and never gets towed. Call back a week later with vagueness and you’ll have to start all over again. Keep note of the date and time the vehicle was tagged. Police have to wait at least 48 hours with no movement before the vehicle is able to be towed. Once that date and time has passed, you may call the officer and/or dispatcher to see if the vehicle has been remanded to the county list for towing. An entirely different department does the towing. Once the vehicle goes on the towing list, MPD is done with it. At this time, there is no direct contact within the towing department. We can only call MPD and ask them to do that for us. Be prepared with your argument and facts and details. Send an email to: info@waimahaihai.org with the date and time that you called in the abandoned vehicle request so that we can document the activity and follow along. If more than 5 days passes AFTER the date in which the vehicle has been passed on to towing, then you may get sympathy from the dispatcher who may pursue it further. If no action has been taken AFTER 10 days, then you may want to take your documented information to a higher authority, such as the mayor’s office or the Maui County Council. The WDNA is working with the Maui Police Department to ensure that every officer and dispatcher, as well as the towing services are all up-to-date with policies and procedure regarding abandoned vehicles on Maui. The goal is to make certain that abandoned vehicles make it off the streets in our district and that pedestrians who, more often than not, share the roadway with parked and moving cars, can walk unimpeded. While at the same time, we want to ensure that a well-intended car owner with some bad mechanical luck can get their vehicle repaired and moving again without having fish their car out of the county lot. So, now you’re informed and highly trained as to what to do. Call, call, call it in and keep Kihei’s streets safer and a bit wider for us all. This entry was posted in News and tagged Maui, Maui County, Maui Police Department, Mehani Circle, Waimahaihai District. Bookmark the permalink. 11/25/14 – car was loaded up on a tow truck! Aloha half stripped car. Thank you to who ever left did this and left it on our streets!